Exceptional pair of brass table lights Bauhaus design by Marcel Breuer, 1925 They were designed for and exhibited at the "Exposition Universelle des Arts Décoratifs" that took place in Paris between April and October 1925. These are a perfect example of the Art Deco Bauhaus style. They both are stamped on the base: Marcel Breuer Exposition Paris, 1925. Spectacular pair of gilded and patinated bronze wall lights with arrow by Jacques Tournus, France, 1940s One more wall light available. 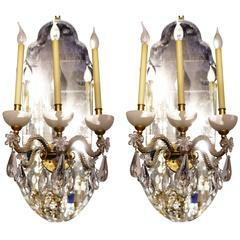 Nice pair of wall lights, France, late 1960s. The gilded metal arms covered with glass beeds, flowers, and glass pendants. Eight pairs available. 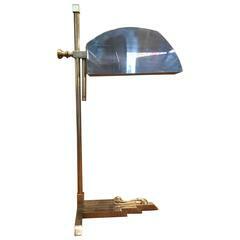 This very beautiful Art Deco desk lamp was designed by Marcel Breuer for the International Exposition of Modern Industrial and Decorative Arts in Paris. E26 socket. Designed for the International Exposition of Modern Industrial and Decorative Arts, in Paris. Composed of brass plated nickel and stamped “Exposition Paris 1925”. Pair of silver washed bronze architectural lamps from the 1925 Paris Exhibition, stamped. Rewired for use in the USA.